It’s fair to say that I’ve recently fallen out of touch with the latest cinema releases. Work commitments have met that I haven’t been obsessing as much as I hoped. 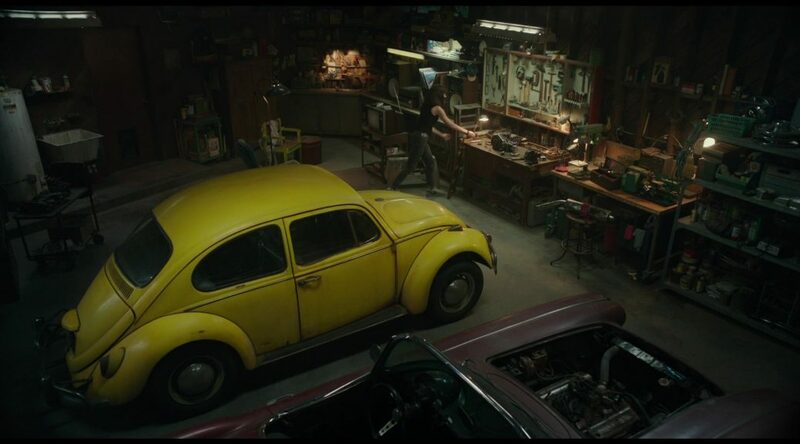 Hearing of Bumblebee long before actually seeing it, I was aware this project existed, but given the lack of a now traditional Star Wars release at Christmas it seemed that this ideal summer blockbuster had been delayed to fill the void. Whether or not this film had actually been purposefully delayed, I’m not sure, but I did find it amusing that with the Christmas decorations all around us we went to see a movie set in the height of summer. Charlie (Hailee Steinfeld) is a young woman working at a summer’s fair in 1987. Grieving the loss of her father and listening to The Smiths, Charlie spends her time obsessing over an old Mustang she owns in the garage, hoping that the open road will bring freedom and change from suburban life and her mother’s new boyfriend. In many respects, it’s a very atypical script, but I did find it was written with a view to this being 2018. Supporting character Memo (Jorge Lendeborg Jr) is not your typical “boy next door” and Charlie – although sometimes jealous of others – is not outwardly looking for fame or popularity. There are several scenes in which you’d expect the typical Shia Le Beouf attitudes, and yet they’re not forthcoming, so as Tears for Fears blasts from the tape deck in the Volkswagen you remember all the fun you can have with your clothes on for a change. In an era of ‘Me Too’ it’s actually rather refreshing to see some elements adapted and incorporated into the film, but it does drag you a little out of reality, and also reminds you just how ridiculous (and possibly dated and even sexist) Shia making moves on Megan Fox was in the original film. The jury’s still out on that. Into this rather interesting mix comes Bumblebee, fresh from the war on Cybertron, which provides G1 Transformer fans like me with their greatest few minutes on film in the franchise so far. I’ll say early in my review that this film is worth watching but it’s the scenes on Cybertron – which in themselves amount to a relative sprinkling – that bring the film together. Cameos from Cliffjumper, Shockwave, Soundwave, Ravage and Arcee are just the beginning as we learn some vital clues as to B-127’s original mission. One of the things I really enjoyed about this film was the minimal casting. Asides from Bumblebee and a few cameos, the most predominant involvement comes from two no name Decepticons. To be fair, they do have names, but I found it rather unusual that a female Decepticon would be so well positioned as to climb the ranks in the organization. I’m not being sexist, it’s just that any G1 Transformers fan will tell you that Arcee was about the only female Transformer with a back story; and she was an Autobot! Shatter and Dropkick (don’t look them up, they don’t have any linage) are introduced as new one shot characters and, to be fair to 2018, it’s a refreshing change. My feeling is that they’re soldiers on a mission and we’re not necessarily dealing with a command line here, which makes the story far less contained then it could have been, and I actually think that’s a real bonus. The appearance of Blitzwing early in the movie is something that caught me off guard, but I was pleased that he was at least given his real name, if not that he used the colours of Jetfire – something that could have made for a really interesting plot dynamic. The film is set in California and looks glorious, even if it limits the use of urban areas due to the timeframe of the plot, but at least one shot of the Golden Gate Bridge from the coastline is enough to put on a postcard. As I’ve mentioned before, there’s a real lack of money with this film, but I think this easily makes it my second favorite Transformer film after Michael Bay’s original – something I remember adoring so much about that first installment. There are so many glorious nuggets of 80s culture that I don’t want to ruin it for you, but look out for that moment where Sammy Hagar is playing on the radio and there’s a scene in the tunnel from Back to the Future. Also, for those film fans, it’s the same song Marty hears as he arrives in an alternative 1985 during the second installment. Of course, as this film is a prequel, there are some serious plot holes. Sector 7 features in the film primarily through Agent Burns (John Cena) and Dr Powell (John Ortiz) but there’s no mention of either Witwicky or the All Spark and – if I remember correctly – it was Sector 7 who built the Hoover Dam around the All Spark and MBE1, that is, Lord Megatron. His complete absence from this film is unsurprising but it’s also interesting that nobody from Sector 7 – especially upon encountering the Decepticons for the first time – doesn’t believe they bear a striking resemblance to a creature that’s been in the basement since 1907. Looking past plot holes like this, and the one in which Ratchet is still trying to fix the vocal processor Bumblebee had damaged (try ripped apart) almost 15 years after it was first lost, you actually do have a really good film. The soundtrack is nothing short of phenomenal and the first twenty minutes of the film paint a picture that between Duran Duran, Bon Jovi and The Smiths we really must be in the 80s…though I myself took a real shine to the scene in which we take a moment to appreciate that Vinyl truly is better to cassette while Bumblebee watches The Breakfast Club on VHS. Oh nostalgia, you’ve done it again.